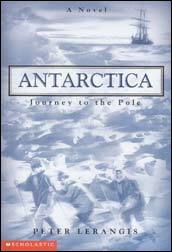 In the year 1909, a secret American expedition was made to discover the South Pole. The expedition's leader was famed Arctic explorer Jack Winslow. Alongside him were his sixteen-year-old son, Colin; his fifteen-year-old stepson, Andrew; and Philip Westfall, the young nephew of the expedition's sponsor, the multimillionaire Horace Putney. The voyage south was not an easy one. Conditions were harsh. Tensions escalated. And when the bottom of the world was reached, things became even worse. In their race for the Pole, Winslow and his party faced the ultimate test of endurance, loyalty, and survival.